How you do it: Get a small craft box from your local dollar store or craft shop. Decorate the interior of the box with colored tissue, and paper. Create a custom sticker with the words "Will you be my Bridesmaid" using StickerYou. Stick that to the inside of the lid. Place your ring pop inside. Added touch- create another photo sticker of you and your bridesmaid through StickerYou and place on top of the box. You can alternatively create a monogram sticker of their first initial. Wrap with ribbon and prepare to "pop the question". Ideal for sweet-tooths! How you do it: Bring your coffee-infused bestie a sweet drink from her favorite cafe shop. Stick a slightly-altered company logo stickers over the cup's logo. She won't notice a difference at first glance, but she'll be able to feel the sticker material when she takes the cup, directing her attention to your message. Quick, clever and super affordable. 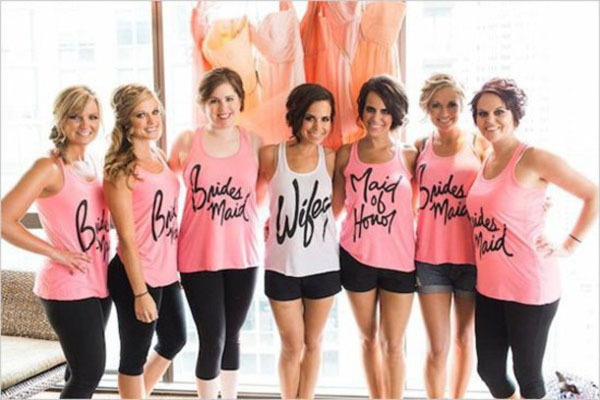 How you do it: Buy blank t-shirts or tank tops for all your bridesmaids. Customize each with iron-on transfers from StickerYou. Add their names, "bridesmaid" and whatever else you choose. Wrap the shirt and gift to your friends. They'll be excited when they open their gift to find "Bridesmaid" branded across the front. Add in some custom temporary tattoos and they'll have full swag ready for the bachelorette party. How you do it: Buy a bottle of your bridemaid's favourite vino. Carefully soak off the label, dry the bottle, then apply a custom wine label from StickerYou. You can design your own label with their name, customize any of StickerYou's templates, or even upload a photo of the two of you and add it to the design. 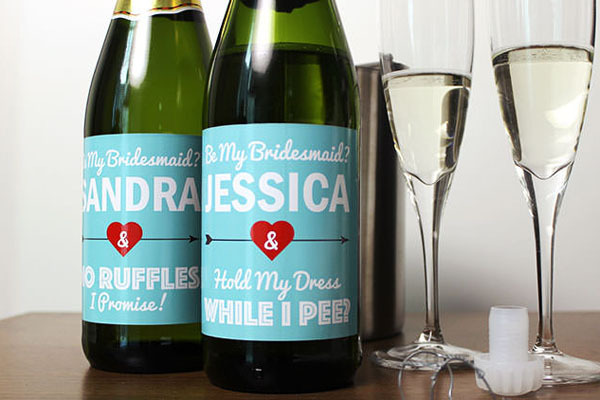 Wrap the bottle as a gift, or break it out next time your bridesmaid is over. Then open and toast to her new status. This is a great idea for those who are willing to spend a little more money or want to make a bigger splash of asking their bridesmaids to stand up with them. 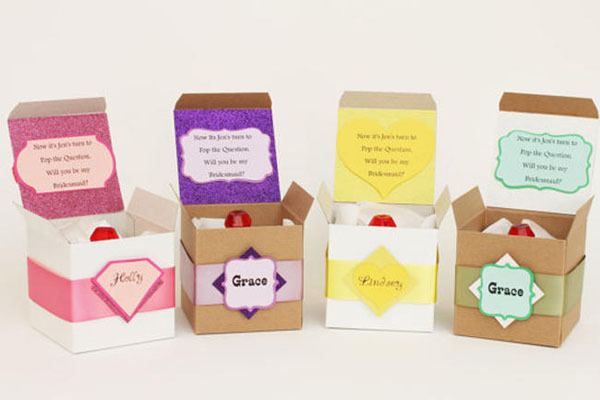 How you do it: Buy boxes at your local craft store or dollar store. They need to be big enough to hold a few items. They can be made of wood, cardboard, tin or any other material. 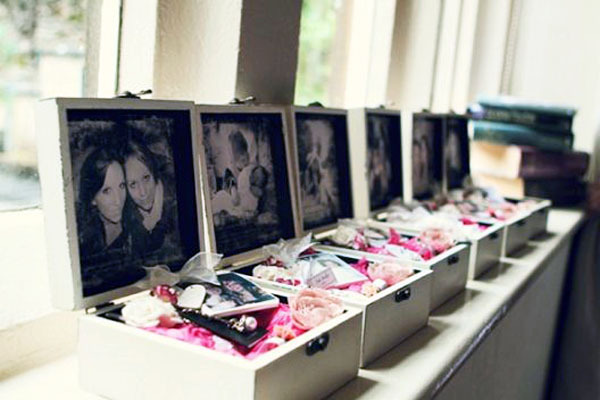 Fill with colored tissue paper and small items your bridesmaids will love. This could include a small bottle of wine or champagne, colored tic-tacs or other candy, personalized jewelry, a small candle, nail polish, a small framed photo of the two of you, or any assortment of small items. Bonus points if the colors match. Fill the box with these items. Create a custom sticker with a few words about why your bridesmaid is important to you or a custom photo sticker of the two of you. 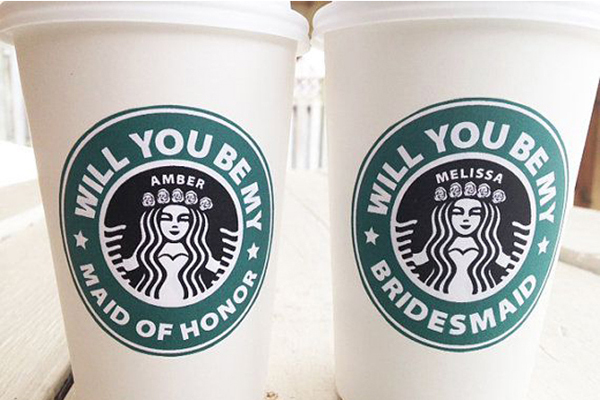 Add the words "be my bridesmaid?" at the bottom. Adhere this sticker to the inside lid of the box, then shut and wrap however you choose. This makes a great surprise gift and can be used as a keepsake box for days to come. There you go! 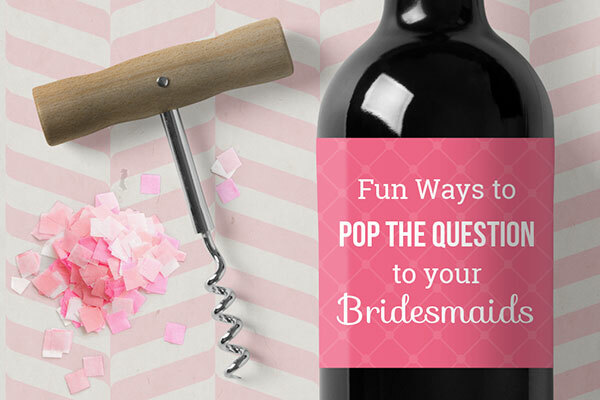 Some fun and fairly easy ways to make your bridesmaids feel special. Half the fun is asking your bridal party to be part of this big event. For more great ideas for your wedding, check out our wedding and events page on StickerYou.com. For more inspiration and great deals delivered weekly, join our mailing list!